The box is called Prisca (from the Latin prius, “antique”), the house is called Arda, like the brand name of the plastic set-squares and rulers that they made us use in school during drawing lessons. Dimensions: 33 cm. long, 11 cm. high, and 11 cm. wide. 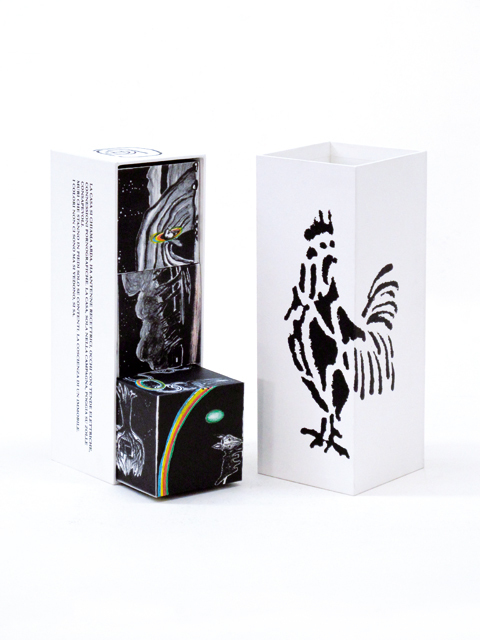 The box is silkscreen- printed in black. It contains three paper cubes, three cubic though not cubist lithographs with tiny silkscreened rainbows inserted as though they were LEDs, cold lights on warm, black marks. The cubes have one side 11 cm. long. The lithographed part of the print was done by the Bulli printer house in Rome; the silkscreened part by the Berardinelli printing house in Verona. Each face has an original drawing by Enzo, 6 faces for each cube, 18 original drawings where the rock, house, trees and wolves have a shared space for living and moving around. The gazes of the faces on the cubes sweep over the images like the wind, making them concrete (reality exists because we observe it); as Sandro Penna said: “could you describe to me a dream that has never come about”? The project attempts to give a new life to the world of graphics where, by now, the overproduction of scattered sheets of paper has dried up a reserve that was once overflowing with technicians able to shape creativity and to channel precepts and specific, almost toxic, chemical fumigations. The development of a three-dimensional sheet (a Chinese cube) shows the uselessness of all the new visual technologies that are being presented as revolutionary. 3D TV, computers with holographic images, video cameras, and all the screens that invade reality… nothing other than technological frauds. We are surrounded by screens because, perhaps, we want to screen, protect, and isolate ourselves: but from what? From the screen. We cannot bear the speedy irony of machines that, by now, are able to take the piss out of us; we don’t want to seem curious, but we are: hungry for gossip and news, remote-controlled massacres. A sheet of paper and a pencil are still the most advanced technology we have for representing reality. I’m anxiously waiting for the day when electricity will fail. The edition is of 30 copies signed and numbered by the artist; the base price is 3,500 Euros.